Vigilance Test assesses your cognitive capabilities, observation acuteness and responsiveness in a strictly monotonous long-run setup. 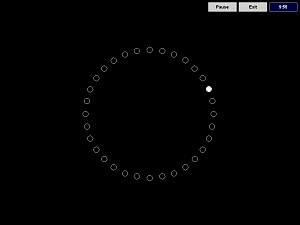 You are to track a small dot running through a circle of (invisible) position items in clockwise direction. At irregular intervals dot leaves a position item out and hits the after next one directly. You are to recognize this event.